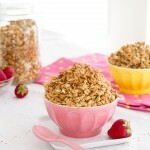 Oil-free homemade granola made with toasted coconut, soaked chia and gluten-free oats. Combine fresh-pressed apple juice with chia seeds. Set aside and allow to soak for 1 hour. Preheat oven to 325F and set aside a large baking sheet. No need to oil it or add parchment paper. Set aside. Add maple syrup, vanilla extract and coconut extract. Set aside. 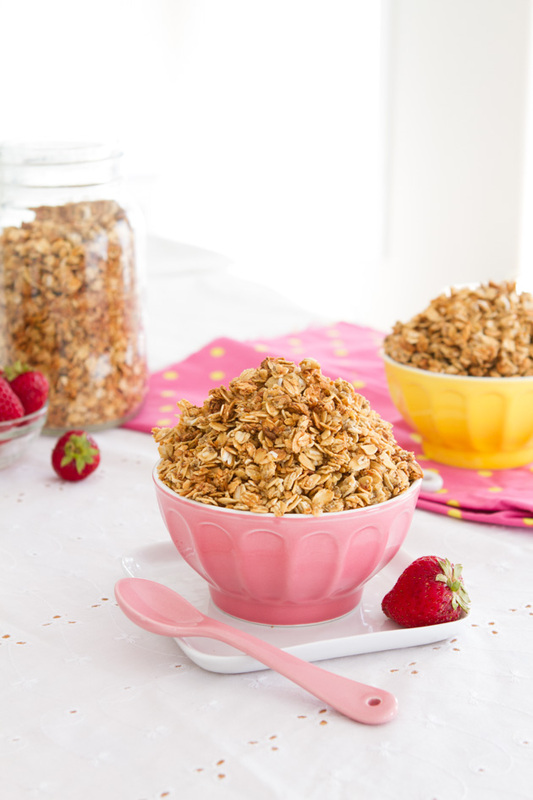 Combine oats, shredded coconut, cooked quinoa, flour and sea salt to a large bowl. Stir to combine. Pour soaked chia mixture over oat mix and toss to coat. Spread mix on the prepared baking sheet and bake in preheated oven for a total of 45-50 minutes. Rotate the mix: at 15 minute mark, 30 minute mark, 35 minute mark, 40 minute mark, 45 minute mark, 50 minute mark. You need to rotate more frequently at the end of the baking process so the mixture doesn’t burn. Remove from the oven and transfer to a cool baking sheet. Allow to cool for at least 1 hour. Store in an air-tight jar, in the pantry, for up to 2 weeks… if it lasts that long. You can also keep it in the fridge or freezer to extend shelf life. Honey: This recipe no longer vegan if honey is used. Flour: Although I haven’t tested it, I think any flour would do well here. Brown rice flour, teff flour, even milled flax seeds. Sugar: If you want to make this a sugar-free recipe, use water or non-dairy milk for the chia egg and replace the maple syrup with a couple tablespoons of xylitol.